A pure vegetable, cod liver oil and lanolin base. Nothing else like it! 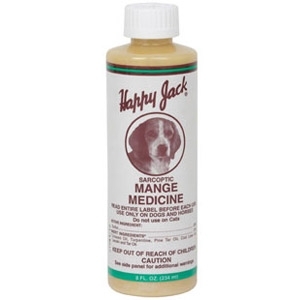 Such soothing relief for skin irritations, fungi, falling hair, itching eczema, hot spots, moist feet and ears, ear mites, puss pimples and severe mange. Our new formula contains Pyrethrins, the most effective water soluble insecticide. 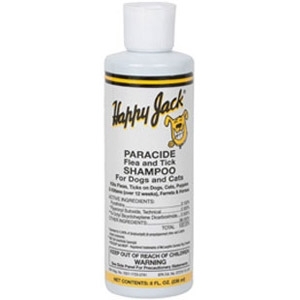 Paracide may be used in conjunction with other flea and tick control measures. It’s gentle, non-alkaline, hypoallergenic, and completely biodegradable. 8 oz. 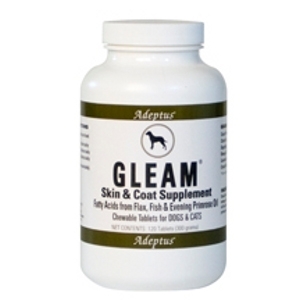 New formula contains two active ingredients which kills fleas and ticks instantly and keep them off for days. DD-33 is water based (unlike similar sprays which are up to 40% alchohol) and therefore gentle to the skin and hair. 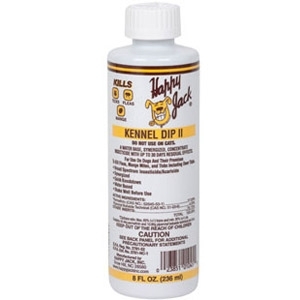 Kennel Dip II is a water-based, environmentally friendly concentrate that provides 30-day residual control of fleas, tick (including deer ticks), lice, mange mites and stable flies. 8 oz. 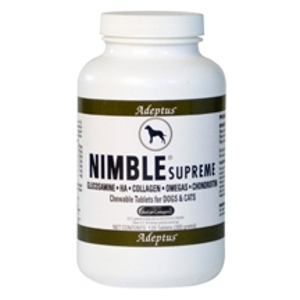 The ideal solution for your animal’s supplemental nutritional needs. 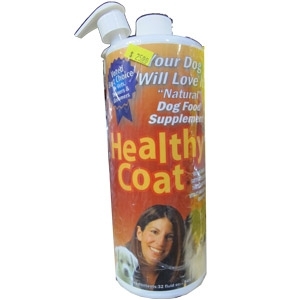 HealthyCoat® is a highly digestible source of Omega 3, 6 and 9 essential fatty acids, Vitamine E and Lecithin, fortified with Niacin, Biotin and Vitamine B12, with no artificial preservatives. 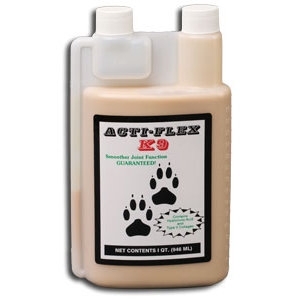 Acti-Flex K9 is a joint supplement formulated especially for man's best friend. Dogs, like horses, develop many problems with joints in their hips, back and legs. 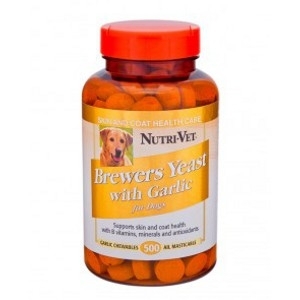 Liver flavor chewable tablets provide trace minerals and B complex vitamins for healthy, supple skin. The ultimate joint & soft tissue support formula with effective levels of glucosamine HCl, triple patented hydrolyzed collagen containing molecularly optimized bioavailable hyaluronic acid & chondroitin sulfate, plus omega-3 fatty acids & yucca. Stamp Out “Itchamacallits!” with our New and Improved Formula. 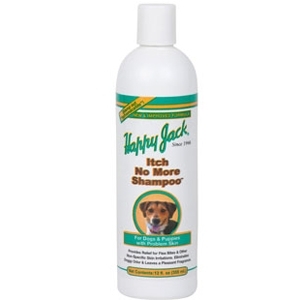 Itch No More Shampoo provides relief for Flea Bites and other non-specific Skin Irritations. Eliminates Doggy Odor and leaves a pleasant fragrance. Stops Itching, Scratching, and Gnawing with First Application! Excellent for generalized or localized skin conditions such as moist or dry patches of skin, and in the control of scaling and odor. Also excellent in helping to reduce irritation and scratching caused by flea bites. 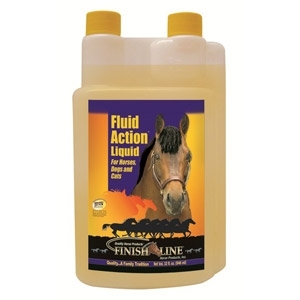 Soothes and deodorizes immediately, and will NOT stain light-coated animals. Contains soothing refined coal tar and sulfur, with coat conditioners. pH adjusted. 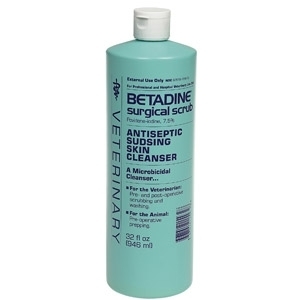 Helps maintain healthy itch-free skin. May help support the immune system. Supports normal vascular and circulatory health. 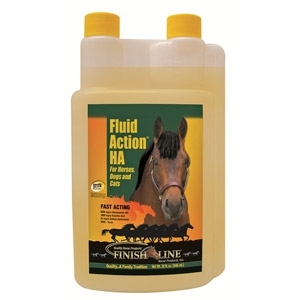 Concentrated liquid form for added convenience and faster absorption into the system. 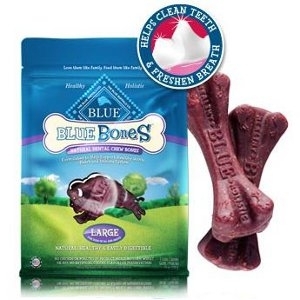 Older dogs need balanced nutrition, too! And, many of them need the added benefit of extra joint support. 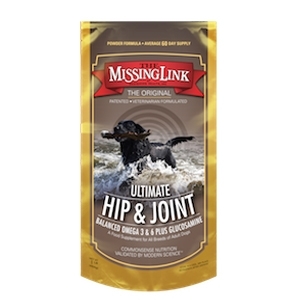 Adding The Missing Link® Ultimate Hip and Joint Formula (Formerly Missing Link Canine Plus Formula) to their food ensures your companion receives vital nutrients such as omega 3 and 6 fatty acids, dietary fiber, phyto (plant) nutrients that promote optimal health and well-being, AND glucosamine hydrochloride for added joint support. Mature dogs love the taste of The Missing Link® Ultimate Hip and Joint Formula . . . and you'll love that each formula contains only the highest-quality, natural ingredients. 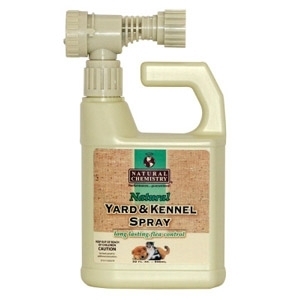 Natural Chemistry's new Natural Yard & Kennel Spray is comprised of natural botanicals that are from EPA's 25b list which contain ingredients that are pre-approved by EPA as effective and safe. Kills fleas & ticks on contact. 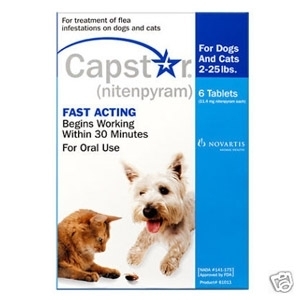 Kills fleas and ticks on contact without harmful poisons and continues to kill for one week. 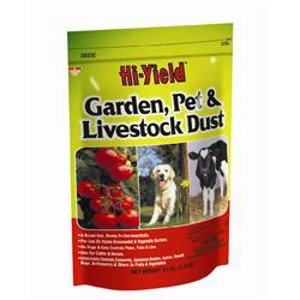 Safe for use on very young puppies, around children and other animals. Does not interfere with or wash out spot-on flea protection. Delightful clove and cinnamon scent. Safe to use around children and other pets. 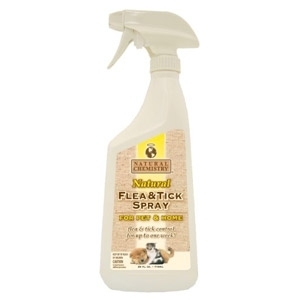 Kills fleas, ticks, flea eggs and flea larvae. Kills and repels against mosquitoes. Starts killing fleas and ticks within 15 minutes of application. Water resistant - remains effective after swimming or exposure to rain. 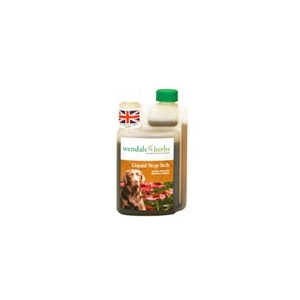 Safe for dogs over 6 months of age. 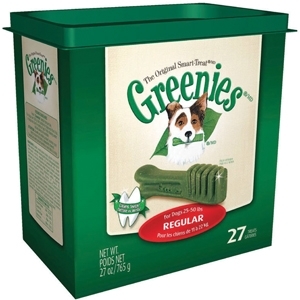 For dogs over 60 lbs. 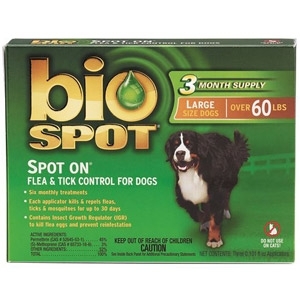 Bio Spot Flea & Tick Control for Dogs is a topical monthly application to kill and repel fleas, ticks and mosquitoes. Bio Spot contains an insect growth regulator to eliminate flea eggs up to one month and prevent reinfestation. Made in the USA. For cats under 5 lbs. 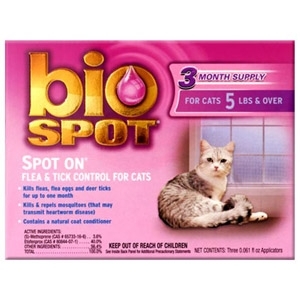 Bio Spot Spot On Flea and Tick Control for Cats is a topical treatment used to kill and repel fleas, ticks and mosquitoes. 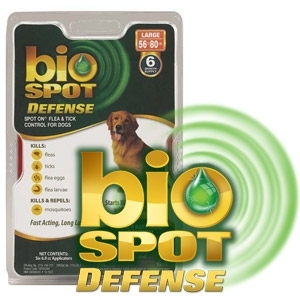 Bio Spot contains an insect growth regulator that eliminates flea eggs for up to one month and prevents re-infestation. Bio Spot for Cats is made in the U.S.A.